This evening at a glittering ceremony in London, with the help of a helicopter and some musical theatre, Jaguar officially revealed its BMW 3-Series fighter. People of the Internet, please be upstanding for the brand new ‘XE’, the most important car Jaguar has launched in a very long time. It’s the company’s new much-vaunted small sports saloon, and will wade into the deep waters against the Beemer, Audi A4 and Mercedes C Class. Serious competition indeed, and much more than just a scaled-down XF. The basics are thus: you’re looking at five seats, a big boot and a range of engines and trims that’ll spin your head. It’ll sit on what Jaguar calls an aluminium intensive architecture, with hollow-cast aluminium for the suspension to keep everything light and stiff. The front suspension design is related to the F-Type’s double-wishbone setup, while the rear gets an independent multi-link arrangement. Engines are all new, dubbed ‘Ingenium’ by JLR, the first of which sees a 2.0-litre, four-cylinder diesel that manages 75mpg and slips under 100g/km of CO2, alongside a 2.0-litre petrol unit. They’re both a whopping 80kg lighter than JLR’s existing four-pots, too. As we’ve told you before, this four-cylinder engine with its aluminium block is modular, alterable in 500cc increments up or down with the ability to incorporate hybrid elements. Then there’s the 3.0-litre supercharged V6 pinched from the F-Type, developing 335bhp in the XE ‘S’, with a 0-62mph time of 5.1 seconds and a limited top speed of 155mph. There’s fully-electric steering, and ‘All Surface Progress Control’; traction control that maintains your momentum no matter the surface, to ensure unruffled progress. The interior adds to this ambience too, with a recognisably Jaguar design, but with a new eight-inch high-definition multimedia touchscreen in the centre console, a welcome replacement for the tired system in the current JLR lineup. As expected, it allows all manner of connectivity, from apps, mobile wifi, voice control, and a sync for your smartphone. There’s also an optional head-up display and modern graphics. And get this: you can even start the XE from your mobile, as well as set air-con and other functions remotely, which is handy for those winter mornings. The car will be built in two brand new factories in Jaguar’s heartland: one in Solihull to build the car, and one in Wolverhampton to build the engines. And the starting price for Jaguar’s new entry-level model? £27,000 when it goes on sale after next month’s Paris Motor Show. 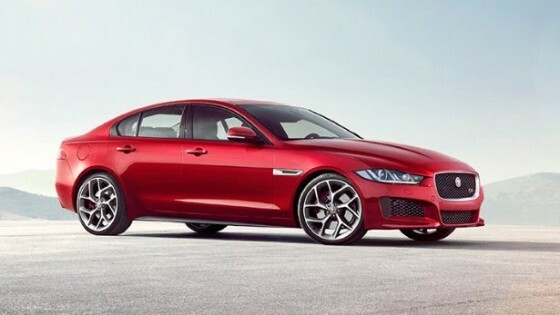 Have a scan through the pics: has this new Jag XE got the smarts to beat the Germans? This entry was posted in News on September 17, 2014 by alistair.